I am trying to make a system which has a Neutron star in place of Jupiter and having a brown dwarf really close to a star called "Anono" Anono is a clone of the sun with an exact same .sc file as the sun besides the name. The brown dwarf is going to be in place of Saturn but when I add the Neutron star Called "Neutronus" the following image shows what happens, Anono turns into a neutron star for some odd reason. And the same happens when I add the brown dwarf called Saturnus. When I put Neutronus into the stars.sc in the stars folder it doesn't show up, but when I put it in the planets folder in the .sc file called "solplanets" Anono turns into a neutron star. I am also wanting to have a hot titan with life and a selena planet more massive then earth in the habitable zone and have a terra with multicellular life going around the selena. Down in the spoiler below I have the scripts. You need a 'StarBarycenter' for your system. 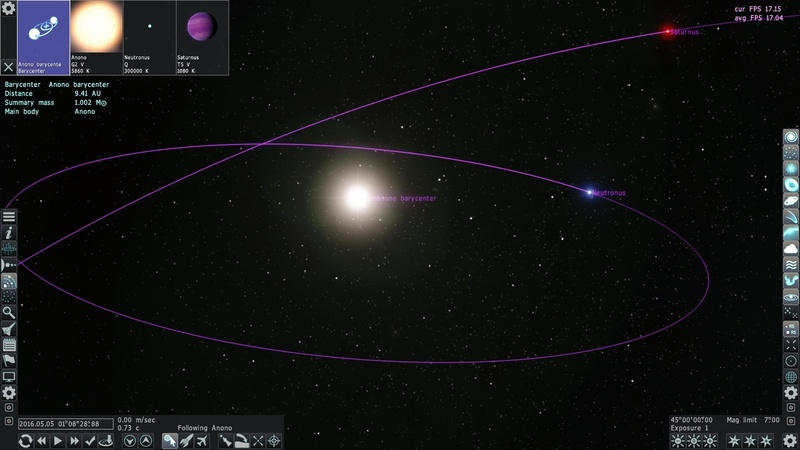 It works in SE 0.974 RC2 not correct, another star like a planet, to put in orbit around a sun. RefPlane "Static" //Sorry, this was my mistake.